The Cheat River Bridge on U.S. 50 should not be confused with Cheat Bridge, West Virginia, which is an old bridge and its eponymous town further south in the state. One of our Cheat River Bridges is still there. It is however not looking too swell, at least not according to a major online source of road imagery. According to bridgehunter.com, the bridge of To-Day was built in 1932. You will have noticed that the covered bridge of Yesterday no longer exists. Built in 1835, it burned to the ground, or rather to the river, on May 23, 1964. Only its central pilings are still visible to-day. It is also possible that the store was located in a building that has been torn down, or for that matter that was destroyed by fire on May 23, 1964. My money is on the building in the first paragraph, though. Regrettably, a very civil message of inquiry that I sent last week to the framing shop now occupying the structure has been met with stony silence. To judge from the rich trove of images available online, this seems to be about the only direction you could point your camera in all of Fundy National Park, and manage not to capture anything of visual interest. 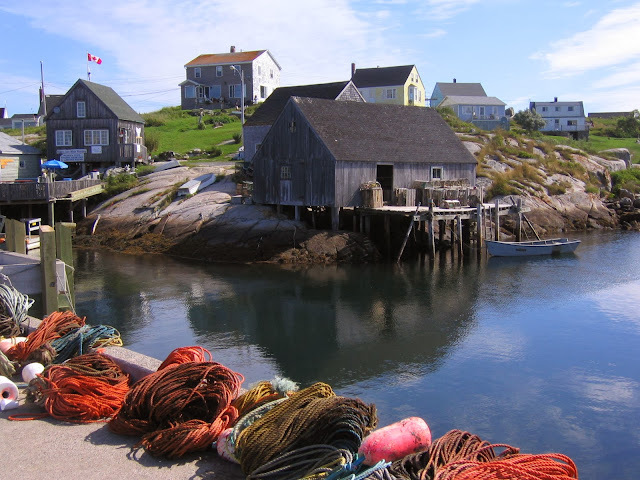 Peggy's Cove is still there, and indeed is clearly kept up as a little tourist gem by the Nova Scotia powers that be. Photographs are abundant on the internet, and you could while away a happy hour looking at the town from different angles and noting which buildings are new, altered, or unchanged since the postcard photograph was taken. Or, you can check out what's happening in Peggy's Cove right this minute! As a quaint old fashioned fishing village, they maintain a quaint old-fashioned location web-cam, like it was 1998. That's some beautiful countryside right there. I need to get out of the hustle and bustle of city life and take a 5000 vacation. Bustle doesn't come up on spell check . . .